This easy, one hour ride is a great option for young children and novice or nervous riders. As you gently stroll through lodgepole forest, you’ll have the perfect amount of time to get comfortable on the horses and get a taste for what it’s like to explore the area on horseback. This two hour ride is our most popular trail for experienced and beginner riders alike. The longer duration allows you to cover more land and take in more scenery than the one hour, including views of the Strawberry and Rainwater Mountains and a brief glimpse into the snow capped peaks of Glacier Park. 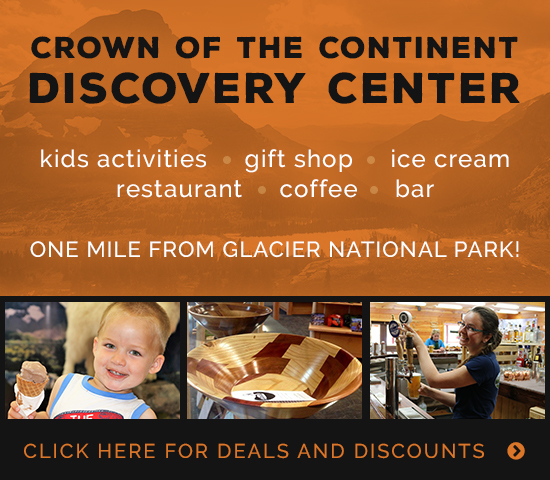 Check in at the West Glacier Corral/Crown of the Continent Discovery Center at 12:45pm for the Glacier Gateway two hour trail ride (see detailed description of the ride above). You will finish up with the ride at 3:30pm giving you a little over an hour to check out the educational exhibits, grab a unique Made in Montana gift or indulge in a quick snack at the Discovery Center before making your way to the Glacier Park Boat Company ticket office behind the Lake McDonald Lodge to check in for your 5:30pm scenic boat tour. If you want a little more time, you also have the option of the 7:00pm boat tour. Please allow for 45 minutes of driving time between the West Glacier Corral/Discovery Center and the Lake McDonald Lodge. This package is offered from June 1st through September 2nd for a total price of $93.25 for guests ages 13 and older and $84.25 for guests ages 7 to 12 years old. This three hour ride offers fantastic views of Strawberry Mountain and into Glacier National Park. You will spend an hour and 15 minutes riding through a lodgepole/aspen forest while slowing gaining elevation until you reach the Glacier Lookout lunch spot. There, you’ll dismount the horses and have time to enjoy your own snacks or one of our hearty sack lunches as you gaze at the snowcapped peaks of the Glacier Park skyline. After lunch, you’ll head back to the corral at a leisurely pace. Be sure to keep your eyes peeled for deer and bear! 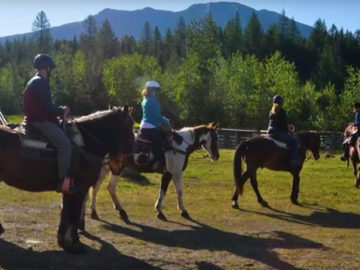 This full day trail ride allows you to spend an entire day exploring the forest and mountains of West Glacier on horseback. Watch the light change through the trees from morning to afternoon and experience the breathtaking beauty of Rainwater Mountain, Strawberry Mountain and Desert Mountain as well as the Glacier Park skyline from a variety of lookout points. The full day trail ride is recommended for experienced riders as guests on this ride will spend roughly 6 hours in the saddle with an hour break for a hearty sack lunch. Check-in time @ 4:00 pm. Check-in time @ 3:30 pm. Please note that an 18% gratuity will be added to the cost of your trip. Check-in time @ 8:00 am & 12:15 pm. Optionally add $15 for a lunch. Check-in time @ 9:00 am. Optionally add $15 for a lunch. Check-in time @ 9:30 am. Includes sleeping bag, upon request.